(Nanowerk News) Most of us know how irritating it is to pay for domestic hot water and space heating and then find out at the end of the year that you still owe. This wouldn’t happen to you if you lived in one of the 1700 solar houses dotted around Germany, Switzerland and Austria. These houses are heated primarily using solar energy: Solar thermal collectors on the roof are used to heat water, which is stored in a large tank and used later for heating the house and providing hot water. Since these houses have excellent insulation, that takes care of some 60 percent of their heat demand. 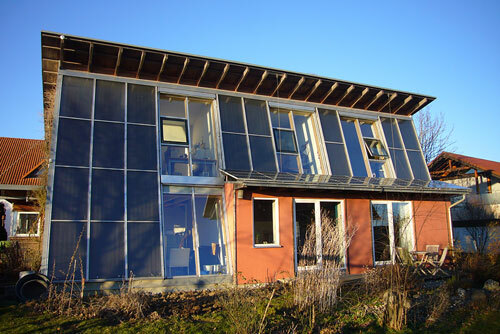 Solar-Active-Houses are ideal for achieving the European Union’s Energy Performance of Buildings Directive, which stipulates that all buildings built from 2021 onwards have to be nearly zero-energy buildings – in other words, buildings that consume minimum amounts of fuel. Solar houses are a viable alternative to passive houses, which rely chiefly on very strong insulation and a ventilation system that recovers and redistributes heat. Solar-Active-Houses have, however, been struggling to overcome one flaw – they hadn’t undergone any systematic scientific testing or objective assessments of their efficiency. It is this scientific groundwork that has now been completed as part of the “Heizsolar” project, conducted by researchers from the Fraunhofer Institute for Solar Energy Systems ISE in Freiburg, Germany, together with colleagues at Solar- und Wärmetechnik Stuttgart, the Technische Universität Ilmenau and the Sonnenhaus-Institut. The project was supported by the Forschungszentrum Jülich and received 1.5 million euros in funding from the German Federal Ministries for the Environment, Nature Conservation, Building and Nuclear Safety, and for Economic Affairs and Energy. So what options do Solar-Active-Houses offer? In theory, it’s possible to tap enough solar energy to cover a building’s entire heating needs. But 100-percent solar houses are still something of a rarity – they are expensive and require that a significant amount of space be given over to the necessary long-term heat storage unit, which can sometimes be large enough to hold up to 50,000 liters. Up to now, the design of solar houses has relied mainly on the practical experience of individual experts. The researchers therefore decided to explore how to further optimize the Solar-Active-House and came up with a suitable simulation model to examine various aspects. For example, to what extent can the size of the tank be reduced in order to increase these houses’ popularity? Solar houses still have their share of challenges to overcome. The researchers have concluded that several of these challenges can be easily solved with thorough planning. Take the heat emitted by the storage tank, for example. While this is welcome in winter, in summer no one wants to further heat up an already warm house. “If you install the tank in the stairwell, for instance, the waste heat isn’t wasted during heating season. And if you also install a window through which waste heat can be released, it won’t bother you in the summer,” says Stryi-Hipp. Other challenges call for further research, including how Solar-Active-Houses stack up against zero-energy or plus-energy houses. These are equipped with photovoltaic elements to generate electricity that is used in part to power heat pumps. The researchers plan to address this topic as part of a follow-up project so they can provide users with reliable assessment criteria.